During 2015-17, in Saudi Arabia the housing and hospitality sectors posted negative growth attributed to the effect of low oil prices; the country witnessed low supply of residential and hotel units. Additionally, Saudi Arabia recorded negative consumer spending as a result of government reforms, changes in indirect tax policies, no salary hikes, wage cuts; this resulted in low furniture sales in the Kingdom, consequently, leading to decline in sale of pillows. However, the pillow market is expected to improve with the stabilization in oil prices. Supply in residential and hospitality sectors are likely to get restored due to rapid urbanization, expected recovery in consumer spending and government initiatives to support tourism growth in the country. According to 6Wresearch, Saudi Arabia pillow market size is projected to reach $15.0 million by 2024. Down and feather pillows are the most popular type in the Kingdom, followed by microfiber, foam & memory foam, and other types of pillows. Down and feather are in high demand as these are more durable as compared to microfiber pillows (the most common pillows in the market at the moment). Amongst the applications, residential segment accounted for majority of the Saudi Arabia pillow market share in 2017. Specialized retailers outperformed other distribution channels such as hyper markets and super markets and traditional stores in terms of pillow sales. Expanding middle class population with growing appetite for status symbol benefitted special retailers in the country. Additionally, wide range of pillows offered by these retailers have been able to entice the consumers as compared to hyper and super markets. The Saudi Arabia pillow market report thoroughly covers the market by pillow market types, by applications, distribution channels, and regions. 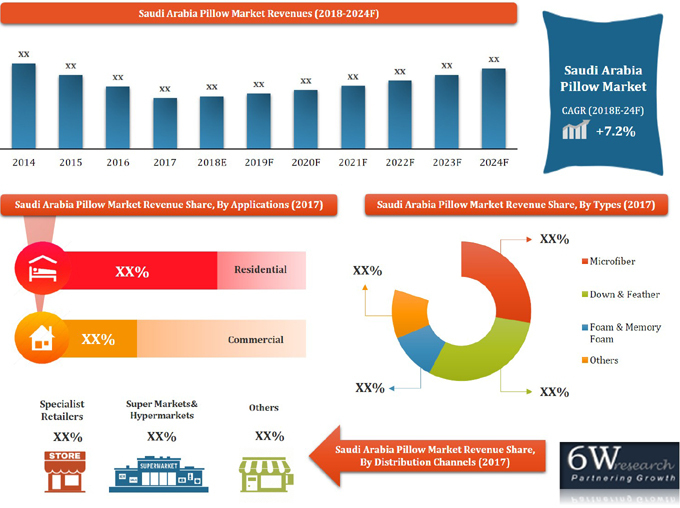 The Saudi Arabia pillow market outlook report provides an unbiased and detailed analysis of the Saudi Arabia pillow market trends, opportunities/high growth areas, market drivers, which would help stakeholders to device and align market strategies according to the current and future market dynamics. 14.1. GETHA BEDDING (M) SDN. BHD. 14.2. MAYA TEKSTÄ°L SAN. VE TÄ°C. LTD. ÅžTÄ°. 14.3. Tempur Sealy International Inc.